Jooeun Bae drives the ball out the bunker during a practice. 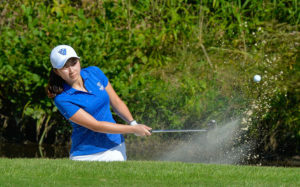 The Georgia State women’s golf team’s fall season has been filled with memorable moments. The three tournaments this season has borne witness to great individual performances, great team performances, and a new team mindset. Now with three tournaments coming up in the month of October, the ladies hope to leave at least one of them with a win. The Panthers have not won a tournament yet but have come pretty close. At the USA Intercollegiate hosted by South Alabama, the Panthers would be in third place through the first two days of the tournament, but would finish fifth by the end of the last day. They were led by Senior Jooeun Bae who shot a final round 75, which was good enough for ninth place and her first career top 10 finish. Bae was not the only Panther to have a good outing at the USA Intercollegiate; the whole team showed up. Four of them placed in the top 26, including Sophomore Jemima Gregson who finished tied for 20th and redshirt sophomore Emily Royer who finished tied for 26th. The most surprising performance came from freshman Harmanprit Kaur who finished 12th, barely missing her second straight top 10 finish, and that caught the attention of the Bae. Even with the early success of the first two tournaments, Kaur was not satisfied. At the next tournament, the Lady Paladin Invitational, she would take her game a step further and lead entire whole team. Kaur shot a career low 1-under 71, which was good enough for another top 20 finish. The team as a whole did not play as well as they wanted, but that did not stop Gregson from enjoying the tournament. The Mental Management Program, Gregson explained, is an elite sporting performance system. It is a mental program that promotes positive thinking and helps the player with their focusing ability; it is a proven system that has been used by PGA-tour winners and Olympic champions. The Mental Management Program is just one of the few things implemented that Head Coach Cathy Mant hopes will help the team reach their goals. Like every other competitor, the Panthers as a team want to win this championship. However, maybe no other Panther desires to win more than Gregson. In last year’s Sun Belt Championship, Gregson was in the lead after the opening day but would finish the championship tournament in the 10th spot. To this day, that still motivates her. The Panthers have three tournaments in the month of October, two in Florida and the other in North Carolina, and they have strong expectations that they can come out on top in at least one of them.